Most people would not turn down a $10,000 custom Italian racing bike, but most people don't have that kind of money to spend for just a recreational ride. There's a perfect bike for every rider, at a price for every budget. The rule of thumb is to buy the best bike you can afford, so you can take advantage of higher-quality components and workmanship. If, however, you are looking for a sturdy bike for a hard-riding kid or a bargain bike for the occasional rider, Next bikes may have the bike for you. Consider what you want from a bike before you buy. If you race, you'll probably perform better with a lighter frame and smoother shifting components. If you ride hard trails, you'll likely prefer a sturdier frame and Kevlar tires to stand up to rough terrain. But if you need a bike for a child who will grow out of any bike within a year, or if you take a leisurely cruise once every couple of weeks in the summer, you really don't need specialized components or the latest technology. Next bikes are basic by necessity, because they are designed for affordability. Next bikes are manufactured by Dynacraft exclusively for Wal Mart. They are all priced under $140, with the children's bikes retailing for around $61 to $79 depending upon the model, as of January 2013. Inexpensive bikes generally cost more in the long run because of maintenance and repair costs, but Dynacraft offers a lifetime warranty on the frame and fork, along with a two-year warranty on the components. The warranty states that it does not cover wear and tear or damage from trick riding, jumping, aggressive riding, riding on severe terrain or in severe climates, so your planned use of the bike is again an important factor to consider. Your Next bike may only last two to three years depending on how hard you use them; but that's why they're so affordable. Next bikes are limited in scope. All of their models are designed like mountain bikes, with thick-tread tires and straight handlebars. They offer two 18 inch models, one for girls and one for boys. They offer two models each for boys and girls in the 20 inch size, and two adult 24 inch models, one for men and one for women. The 18 inch and one of the 20 inch girl's bikes have curved top tubes, while the other 20 inch and the women's bike have straight top tubes. The next bikes are solidly constructed, but you won't find any stunning technology. The frames are steel, which is sturdy but heavy, and the company uses it's own components. The adult bikes are dual-suspension with V-brakes and 18 speeds, while the children's bikes are all single-speed with caliper brakes. The simplicity of the drive means that you can do much of the maintenance yourself, and the owner's manual includes detailed maintenance instructions. 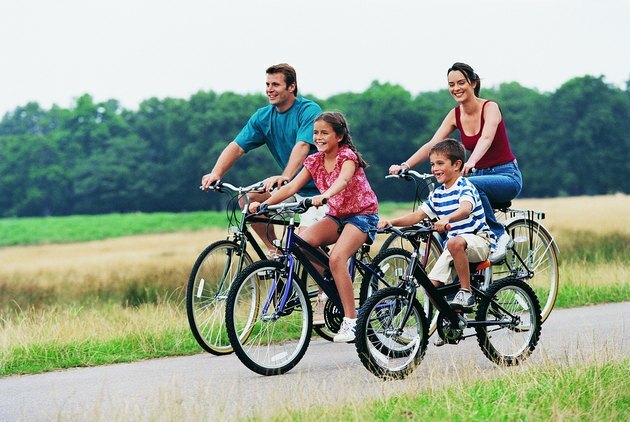 You won't win the Tour de France on Next bikes, but the whole family can ride together without a huge investment.